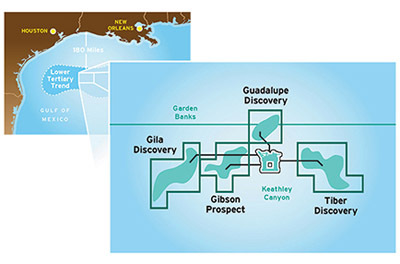 Chevron Corporation’s subsidiary, Chevron U.S.A. Inc., will work with BP Exploration and Production Inc. (BP) and ConocoPhillips Company (ConocoPhillips) to explore and appraise 24 jointly-held offshore leases in the northwest portion of Keathley Canyon in the deepwater Gulf of Mexico. Chevron will be the operator. "Chevron has a proven track record for delivering superior results in complex deepwater developments," said Jay Johnson, senior vice president, Upstream, Chevron Corporation. "We will work with our co-owners to evaluate how to develop these leases, along with our recently announced discovery at Guadalupe."